Let’s Talk Gear | What Goes With What? Adventures in Travel, Sewing and Color. Let Yourself Go! Camping gear… How do you stay organized camping? Pouches work for me. The Box Pouche – Sewing gear, small rotary cutter, thread, bobbins, etc. Waxed Color Block Pouch – Pattern by V & Co -Shower gear. Shampoo, conditioner, body wash and razor. This one came in so handy when I didn’t close the conditioner all the way so it leaked. The waxed canvas totally contained the liquid and easily rinsed out. Tula Pink Camping Color Block Pouch– Pattern by V & Co – Misc personal hygiene. Nail file, clippers, deodorant, Tylenol, band aides, a little make up, etc. 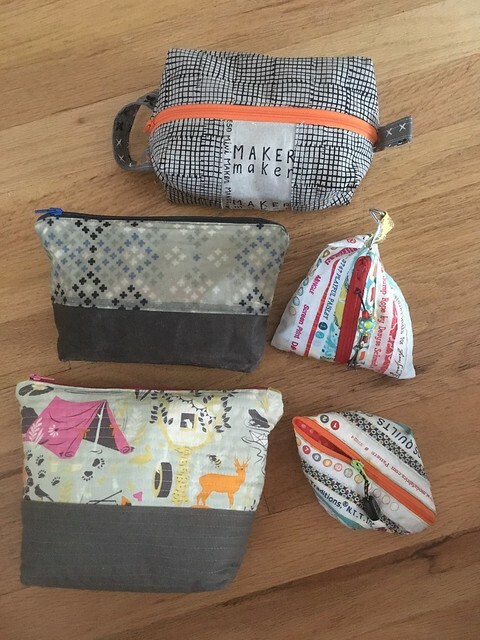 Triangle Zip Pouch – charging cords and plug ins for electronic equipment. Sweetpea Pod – Pattern by Lazy Girl Designs – I hung this little cutie on my back pack so that my chap stick and a little cash were easily accessible. Grocery Bag – Pattern by Michelle Patterns – A bag to keep it all together. 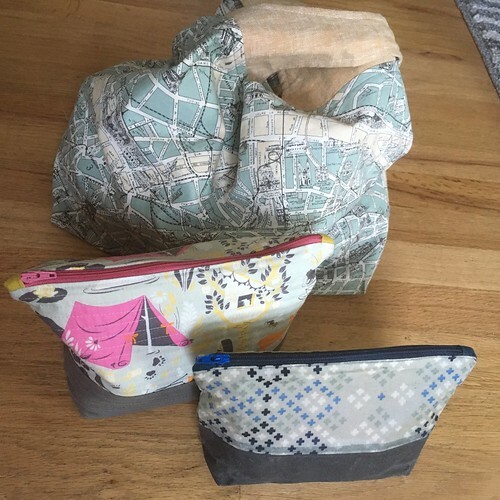 This entry was posted in Adventure, Sewing and tagged Adventure, color block pouches, Grocery bag, grocery tote, Lazy Girl Designs, Michelle Patterns, off grid, sweetpea pod, Tula Pink, V & Co, zip pouch by Diana. Bookmark the permalink. What Goes With What is a participant in the Amazon Services LLC Associates Program, an affiliate advertising program designed to provide a means for sites to earn advertising fees by advertising and linking to amazon.com. Be assured that my opinions and recommendations are always my own, and that I would never suggest a product that I don’t actually use and enjoy.